With oil constituting 95 percent of Venezuela’s export earnings and almost half of the government’s income, the country is plainly oil-export dependent. This meant that a sudden slash in global oil prices ensued in more than a 40 percent loss in revenues for Petróleos de Venezuela (PDVSA)—the state-owned oil-and-natural-gas company, in 2015 alone. The economy is exacerbated by price-controlled goods, an economic policy in play since the era of Hugo Chavez. As PDVSA is a significant investor in the country’s stores which provide these goods, the company’s losses resulted in producers refusing to manufacture goods, as doing so would mean economic losses. A severe shortage of foreign monetary inflows has directly affected the government’s ability to buy basic commodities from other countries, resulting in serious shortages of staple goods and medicines. Rising unemployment, violent crime, inflation rates, rolling blackouts and increasing cases of malaria are rife conditions currently. With the disastrous prevailing conditions, it is unsurprising that the country has been ridden with widespread anti-government protests. 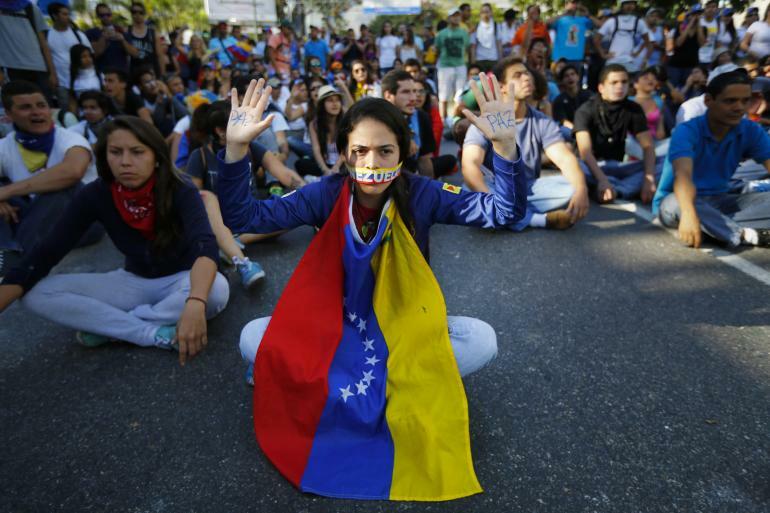 Protests also arose due to President Maduro’s drastic decision to rewrite the 1999 Constitution, by introducing a Constituent Assembly to bypass the current legislative body, the National Assembly. Although the Assembly is yet to formally rewrite the Constitution, it maximized Maduro’s power within the government by electing close family members into the Assembly. While the government claimed more than 8 million people cast their votes for this change, the number of votes was inflated by at least 1 million. Since its election, the Assembly has trialed opposition leaders for treason and banned all protests. Any protests have been met with systematic use of excessive force, resulting in 124 deaths and the detention of more than 1,000 individuals. It is understandable, then, that the U.S., E.U, Argentina, Brazil, Chile, Columbia, Costa Rica, Mexico, Panama and Peru have either maintained their sanctions on Venezuela or have condemned its actions. Russia and China, along with Bolivia, Nicaragua and Cuba, continue to support Maduro’s government. The debt deal signed between Venezuela and Russia will have Venezuela pay its $3.15 billion debt in a span of 10 years. The goal is to use the funds to generate economic development, allowing Venezuela to repay its accumulating foreign debt. China is also in support for the deal, as a staunch monetary supporter of Venezuela over the years with Russia. Given that the U.S. is the world’s biggest advocate of democratic values and a capitalist economy, it is unsurprising that it currently has sanctions on Venezuela. Historically, the U.S. has always had a vested interest in the affairs of Latin American countries like Cuba, Columbia and Nicaragua due to their geographical proximity to the U.S and a threat of communism. It has also been a leader in foreign aid and assistance, particularly with institutions like the World Bank and International Monetary Fund, targeting conditionality based debt-restructuring. The Venezuela-Russia deal, therefore, highlights a strong shift in the traditional pattern of monetary flows targeting debt-bailout and economic development. It is one of the many recent countries denied financial assistance by the Western donors but supported either by Russia and China or both, like Syria, Cambodia or the Philippines. It suggests that financial assistance bound by conditionality may be ineffective, when Russia and China are willing to overlook the absence of democratic freedoms within a country. This is important because Venezuela bypassed the IMF and the Paris Club to receive financial assistance directly from Russia. The dynamics of financial assistance are clearly changing, also proven by China launching the Asian Infrastructure Investment Bank in 2016, viewed as a rival to the World Bank. The deal is even more significant because of Venezuela’s close proximity to the U.S, marking the presence of Russia in the region again. The question now is not who to give aid assistance to, but rather how to provide it. Removing conditionality-based aid is unwise, potentially increasing the power of corrupt governments. Market aid competition is also necessary and beneficial for healthy world economies. Given the historical rivalries between the U.S., Russia and China, however, it will be interesting to see how the U.S. responds to increasing Asian financial assistance. Is the era of Western financial dominance weakening? Only time will tell.